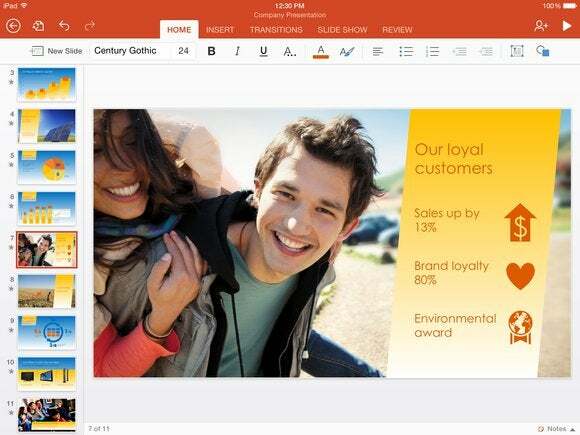 Microsoft’s new version of Office for iOS unifies the user experience across all devices—great and small—and opens the door to free editing and content creation, regardless of whether you have an Office 365 account. Our reviews of the new Microsoft Office for iOS suite, which includes Word, Excel, and PowerPoint, show how the ultimate productivity tools have squeezed onto smaller screens with surprisingly little compromise. Word for iOS: Word for iPad was (and is) an excellent iOS word processor—an Office app for your iOS device that offers substantial document creation and editing tools, with an interface that's clutter-free, so creating and editing documents on your iPad is a cinch. Microsoft’s most recent update offers free editing for all, adds Dropbox integration, and now includes an app for your iPhone that you can use to create and edit documents. Read our full review. Excel for iOS: Microsoft’s first release of Excel for iOS was well designed, but it was missing some things, like the ability to print. The biggest issue, of course, was cost: You needed a $100 per year Office 365 subscription to create workbooks. As of version 1.2, released in early November, that restriction has vanished: Excel for iOS can now be used to create spreadsheets, for no cost other than signing up for a free Microsoft account. The old version didn't let you really do anything without paying, while the new version lets you do nearly everything without paying. Read our full review. PowerPoint for iOS: Now at version 1.3, PowerPoint for iOS works on iPhones as well as iPad, and it’s adopted a new freemium model in which most of its features are available even to those who don't pay for Office 365. Many major complaints about the debut version have been addressed in this upgrade. And—shocker—you can even opt for Dropbox file storage as an alternative to Microsoft's own OneDrive. Read our full review.